The New Moon at 21+ degrees of Aquarius fell exactly square the lunar nodes on the Taurus-Scorpio axis. The luminaries aspected tightly several Centaur planets (Amycus, Bienor, Pholus and Thereus) and several orbit-crossing minor planets beyond Neptune as well (Eris, Haumea, Ixion and Sedna) at 20-22 degrees of the signs that they occupy. When the Centaurs are present, we are dealing with the psychological term shadow. We all have a shadow, the rejected, irrational part of our psyche, which we tend to project into other people with feelings of anger and fear. The more these projections are unrecognized, the blacker and taller is the shadow. According to Carl Gustav Jung, the shadow may be in part one’s link to more primitive animal instincts, which are superseded during early childhood by the conscious mind. In Finland we are currently experiencing a fierce wolf hunt comparable to the one told by Nicholas Evans in The Loop. The book tells a story about a ranching town in Montana, where appearance of wolves reawaken an ancient hatred. It is a story about man’s fight against his own dark side. The wolf is classified as a highly endangered species in Finland. In recent years our small wolf population has collapsed because of poaching. When in 2006 there were about 300 wolves in our forests, the current figure is about 150. An unusually ugly case emerged just recently in Perho. Three wolves out of a pack of five were shot dead. The Finnish Game and Fisheries Research Institute had been planning to equip the herd with tracking collars this spring. The illegal hunt had been well planned, and one of the poachers was in a high post in the local game preservation society. The wolf-hatred is incomprehensible, as they have not attacked humans. Erkki Pulliainen, popularly known as “Susi” (“Wolf”) Pulliainen, a Finnish biologist and an expert on wolves, said a couple of days ago, that the debate on the evilness of the wolf has reached the point, where it may turn to an advantage for wolves. Nicholas Evans – who has his natal Sun opposing a conjunction of Pholus and 1992 QB1 in his birth chart, by the way – has described The Loop: “It’s about a pack of wolves returning to a place where they had been cruelly hunted to extinction and how their return sets aflame old hatreds. In a way it’s a fable about racism: how ignorance brees fear and hatred and, ultimately, violence.” It is not surprising that lately in the Finnish news one of the hot topics besides the poaching has been racism in Finland. The lunar nodes are the points in which the Moon’s orbit around the Earth intersects the ecliptic, the apparent path of the Sun around the Earth. Thus the nodes involve all three bodies. The South node deals with the past and the matters that are familiar to us, and which we find hard to let go of. The North node shows the direction which we should strive for. The Moon symbolizes our instincts and emotions; the Sun is the symbol of the ego. The lights were squaring the lunar nodes at the New Moon. Melanie Reinhart calls the points square the nodes as the “balance points”. The New Moon in Aquarius marks the moment in time in which we can let the Centaurs begin to do their healing job and start acknowledging our shadow. 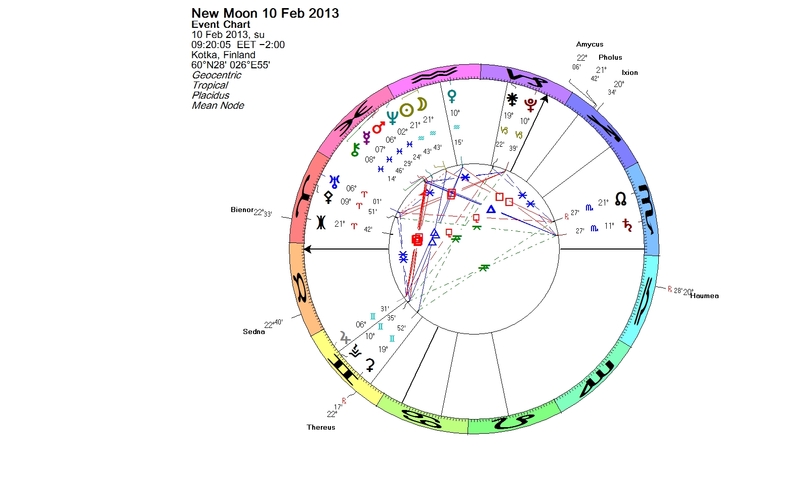 This entry was posted on Tuesday, February 12th, 2013 at 2:20 am	and is filed under New Moon. You can follow any responses to this entry through the RSS 2.0 feed. You can leave a response, or trackback from your own site.